How is the of the roof at your home or ? When was the last time you or a professional went up to take a look around? 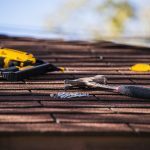 If you haven’t been keeping up with your roof maintenance, you could be neglecting some pretty serious issues. Even if everything seems alright from the inside, you might be one wind or rainstorm away from expensive damages. Not sure where to start when it comes to taking care of your roof? Read on to learn everything you ever needed to know roof maintenance. You will be able to go longer between total roof replacements if you take the time to maintain your roof properly. If properly installed maintained, your roof can last up to 20 years. Without maintenance, you cut off 5-10 years of your roof’s lifespan. If you plan on staying in your home longer than that, a replacement every 10 years will get expensive — fast. A leaky roof can lead to a of other problems with your home’s structural integrity. This can include rusted steel rotting wood. A leaky roof can wreak havoc on your carpet, furniture, electronics. To avoid expensive internal damage, make sure you’re maintaining your roof. If your commercial property has a leaking roof, you’re creating a hazard for your customers every time it rains or snows. Someone might trip over the buckets containers left all over the place to catch water. Furthermore, if water misses the bucket gets on your floors, someone could slip fall. Preventive maintenance is much more cost effective than having to replace your entire roof. The first step in preventive roof maintenance is to conduct an inspection. You should have your roof inspected at least twice a year — once in the spring once in the fall. Other potential hazards that you can be on the lookout for include trees growing too close to the roof. This can lead to scratching, gouging, shingle punctures, clogged drains from falling leaves. Additionally, look out for black or discoloring streaks. This is a sign that you have mold, algae, or fungus on your roof. Maintaining your roof can prevent life-threatening disasters. Keep in mind that your home or may be vulnerable to different risks depending on the type of roof you have. Built-up roofs can be vulnerable to blisters. Blisters are air pockets that form when a roof is not built properly. Blisters are difficult to repair. You usually have to wait until they break open to do anything them. Another common problem that built-up roofs are vulnerable to is displaced or damaged surfacing. Surfacing protects the waterproof bitumen on your roof, but it can be damaged by strong winds. If the surfacing is damaged, the lifespan of the entire roof is compromised. Modified bitumen roofs, especially those that date back earlier than 2004, can also be vulnerable to blisters. If you live in a high-UV area, your modified bitumen roof might also be vulnerable to sun damage. This can lead to exposed membranes leaks. If you have a single-ply roof, you might notice raised spot fasteners. This can be a result of building movement or excessive foot traffic. Raised spot fasteners can often be repaired by cutting an X in the area, re-seating the fastener, then putting a patch on top. Single-ply roofs can also be vulnerable to open seams. Since this kind of roof has no redundancy, it is the only thing standing between your building and the elements. 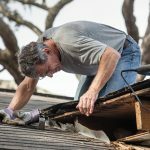 Keep in mind, too, that single-ply roofs can be torn easily by dragging equipment or tools across them. Metal roofs also can suffer from raised fasteners. When fasteners are raised on a metal roof, it is usually because they were not seated with the proper gaskets. Metal roofs can also suffer from corrosion. A corroded roof can be disastrous for your home or building, so it’s important to catch it early. This is why regular inspections are so important. Corrosion often comes from rooftop HVAC units. These units produce condensation that contains coppers ions and acids that damage the protective coatings on metal roofs and cause rapid rusting. To avoid this damage, duct the water to keep it from running across the protective coating. After you’ve inspected your roof, it’s time to repair any of the issues that you noticed. 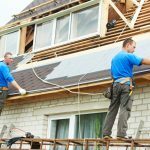 If you make repairs while they’re small, you can save money, prevent damage, and avoid having to do a much bigger replacement sooner than you’d like. Some basic repairs, like small splits, can be handled on your own. Keep some polymer-modified mastics on hand to easily mend these splits. Polymer-modified mastics are flexible, UV resistant, and have low-temperature flexibility. This will prevent cracks and leaks in cold weather. Reflective coatings are another good preventive investment. Look for high-quality coatings that are UV-resistant and able to withstand harsh environmental conditions. It’s also ideal to invest in coatings that contain aluminum paste for maximum reflection. Reflective coatings have been proven to increase the R-value of a building, so they will also help you save money on energy costs. 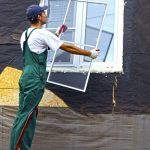 If you have no experience with roof maintenance, or if your repairs go beyond basics fixes, you should definitely hire a professional to help you. Not only will you eliminate the risk of potentially injuring yourself, but you’ll also be guaranteed a high-quality, long-lasting repair. Whether you need a brand new roof or help with repairs, we’re here to help at Davis Contracting. us today for a free inspection or estimate!